Mafi is proud to be one of the only timber flooring products that can be placed over underfloor heating successfully, and without releasing toxic chemicals into the atmosphere due to being 100 percent all natural. 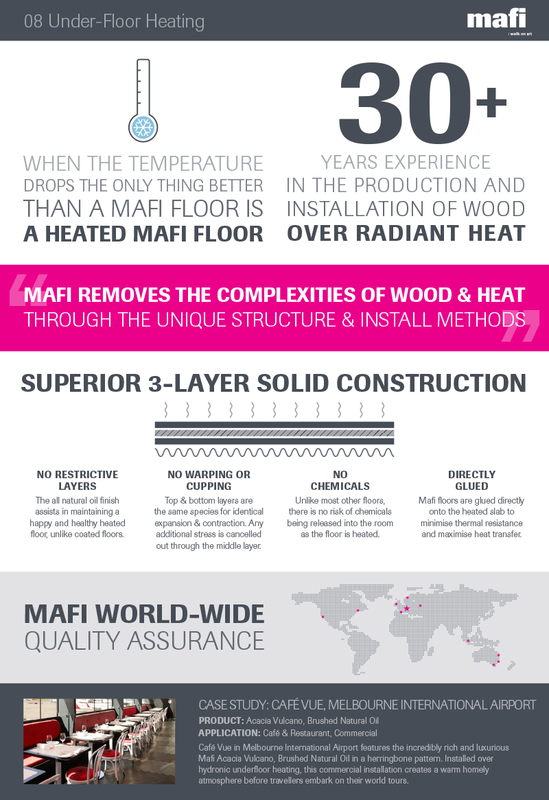 With over 30 years of experience in production and installation of wood over radiant heat, Mafi can guarantee you a beautiful, warm timber floor. Mafi’s superior 3-layer construction, ensures the top and bottom layers are made of the same wood species, allowing for identical expansion and contraction. The middle layer is made of a fast growing conifer, generally spruce, running across the grain for added strength, which also cancels out any additional stresses. Due to these unique properties, as well as the all-natural oil finish, Mafi timber does not warp or cup when placed over underfloor heating. Mafi floors are glued directly onto the heated slab to minimise thermal resistance and maximise heat transfer.